Starting this brand was motivated by a number of factors, namely representation. Having experimented with numerous mediums and multiple concepts I wanted to concentrate on one core value, which was diversity. Previously I have written about race, my identity and growing up in a world where there were very limited faces and more importantly role models I could align myself with. One minute I did not fit, the next I did. It has always been confusing, the notion of identity. The disconnection from Indian culture that is part of my mums heritage, lost through her adoption has always resonated with me. It has been a productive catalyst inspiring my creativity. Art allows for a platform, a voice to be heard through visual expression and communication. Experimenting with my favourite media - collage, mixed media and print making has been both therapeutic and exciting conceptually. Whilst there have been a variety experiments with other concepts such as capitalism and consumerism inspired by The Beauty Myth by Naomi Wolf, which I will write about at a later date. I knew I wanted to focus on this notion of diverse, identity representation and trying to create a space to express this. This led up lots and lots of different experiments before I had settled on the final design, which I had written about last week. Who knows if these will turn into something? Water colour painting that I started and stopped as I quite liked the combination between the black and white elements in stark contrast to the colour. The name of the original piece has always been called Abstract Asian, which is always close to my heart and will continue to be the most important imagery and is an avenue I wish to explore more. As the title of this story suggests, reflecting on my history is important to create a meaningful brand. My mother was born to an Indian mother and an English father. She was adopted due to interracial relationships not being accepted at the time. Ironic as the 1960’s is heralded as the start of female emancipation - only for some I guess? Her adoption, by a German mother and English father, who had also adopted a boy from Singapore and another girl of African or Caribbean mixed heritage, were very progressive for their time. The United Colours of Benneton a friend of mine coined some time ago. However sadly due to the time there was no celebration of cultural diversity. You were made to fit in the white mould and suffer racial discrimination as and when it came. It came. We have spoken about tracing her background but it is fraught with many bureaucratic hurdles that I do not want to enforce as it is her journey, her emotions. Exploring identity, embracing identity and seeking role models who I can align my self with. Feeling empowered. Thinking about my childhood made me delve into the archives and find images that made me reminisce and smile for one reason or another. 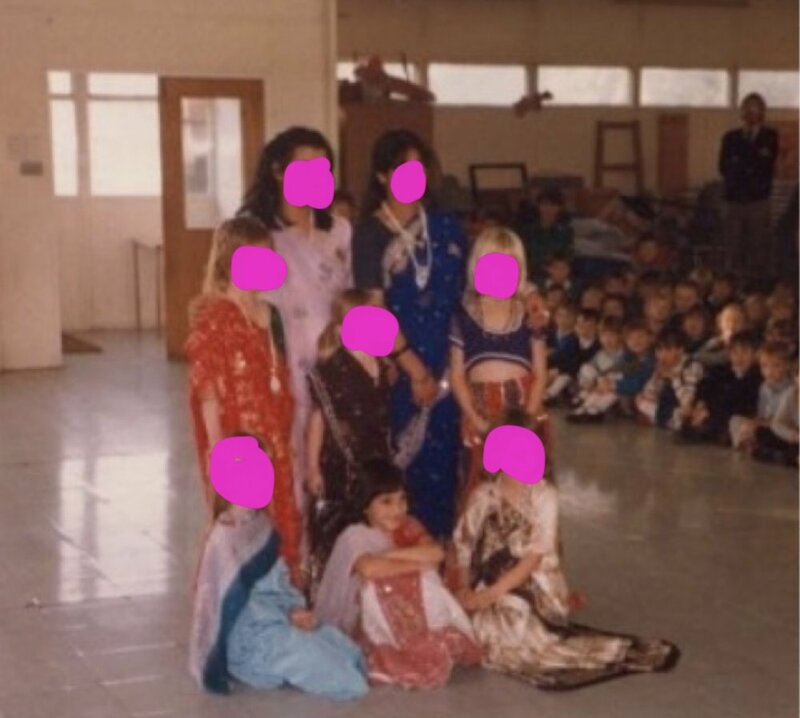 I love this photo as I remember the experience of wearing Indian clothing and celebrating Divali by dancing in front of the school. It really was such an exciting experience and one that was given to me by my teacher. I thank her for that as I was able to celebrate Indian culture that was part of my heritage but not within my home growing up due to my mums adoption. It was a celebration of the festival but internally it was my own celebration. I recall loving the colour of the clothes and the embellishment, sequins galore, it looked and felt so luxurious. And practising the dance routine was so much fun. I remember we had batons to use and make them click, the sound was electric. This photo makes me laugh. I wanted to wear trousers so badly. I was quite tom boyish when I was younger and liked the freedom they brought and was very much insistent on wearing them. I was aware of what I wanted from a young age I think that is why my teacher put me in certain roles, to channel my energy and determination. This emotive energy is what I want to remember and channel in to this work, this business, the brand and ethos. There are many stories about there. So much variation, diversity, that needs to be recognised and given a space in which to be celebrated. I hope to contribute to this narrative.